I confess to being seriously delighted with Tony Robbins, the self-help guru. I remember decades ago, when he first hit the speaking circuit, I couldn’t stand him. Then he, and I, grew up. He also became psychologically savvy – not just a self-help wannabe, and I found his 21st century paradigms of human relationships compelling and spot on. Here I was, getting ready to release an entire ebook series with “successful” a main part of the title, not to mention concept of the book, and here was one of my heroes taking success apart at the seams. For Tony, being alive trumps success, so he’s thrown success overboard. I do this because “being alive” has been my north star ever since I heard Bill Moyers interviewing Joseph Campbell who cleared up a pet peeve of mine about humans needing to find the meaning of life. That idea, that humans main concern is to find the meaning of life, had always irked me. I didn’t believe it. That idea felt flat and totally devoid of life energy. So when Moyers asked Campbell about humans looking for the meaning of life, and Campbell answered with “Humans aren’t looking for the meaning of life, they are looking to feel alive.” I remember jumping out of my seat and pumping my fist in the air! It seems as if, for Robbins, success is in the same place as “meaning of life” was for me. But I’m not ready to give up on the idea that success, as an experience, has value and validity for humans. What do you think about success? Does success, as a lived experience, have any value for you? Success for me is the fact I am still an artist to this day. I have the freedom to do what I want to do. I am able to heat and eat from my art life effort. I do my own business, I manage to sell enough work to be successful. Success isn’t bad, it is just a somewhat immature and selfish notion. Success is what you attain for yourself. As you grow older you begin thinking about impact. How can I create an impact… the notion is then about helping others and makes success seem less important. Somehow for me success, immature, and selfish don’t really go together. There are, no doubt immature and selfish people with corresponding ideas of what success is running around out there, but there are plenty of other people with different ideas altogether. 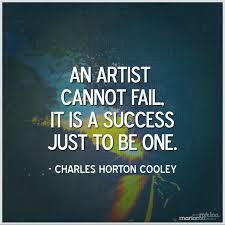 Success is like art: it’s a process. We try it, put our best into it, and it never really turns out quite like we had in our head. So we go at it again. Sometimes we like the result, sometimes we don’t, but we can always learn something new during each attempt. Sometimes we love the result…it’s perfect! For a few minutes or days or even years, but eventually we don’t feel successful anymore. It’s not enough, or it’s too easy. We’re bored. Presto! New idea of success develops, and we’re off again. It’s a process. Proceeding is satisfying. And it’s fun.